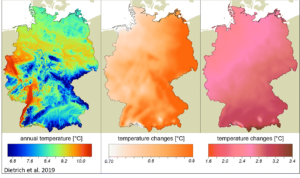 The “NFI 2012 environmental data base climate” is part of the environmental database of the German National Forest Inventory. It contains climate information for 26,450 inventory points generated from gridded daily climate data for 1961–2100 at a spatial resolution of 250 m. Grids are based on DWD-Observations and REMO EURO-CORDEX climate projections. Access to the databases is provided via the URL: https://doi.org/10.3220/DATA/20180823-102429. Associated metadata are available at https://agroenvgeo.data.inra.fr/geonetwork/srv/fre/catalog.search#/metadata/d0789030-c94e-4883-8d38-2a7332c98673.